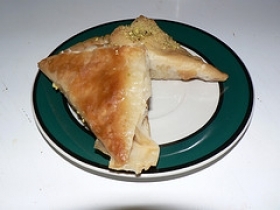 Have you made Baklava (Low Fat Low Cal Version)? 1. This rich-tasting baklava contains half the amount of sugar and a fraction of the fat you would normally use, thanks to reduced fats, sugar, and nuts. 2. The results will fool anyone. Combine pistachio nuts, sugar, cinnamon and rose water in small bowl. 3. Using half of filo sheets (cover remaining with plastic wrap to prevent from drying out), place 3 sheets in bottom of lightly greased 13x9" baking sheet. 4. Brush with some of margarine. Sprinkle evenly with nut mixture. 5. Place remaining sheets over nut filling, brushing after every third sheet and top sheet. 6. 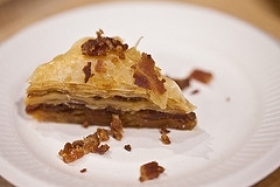 Cut baklava at 1-1/2" intervals diagonally to form pattern of about 35 diamond shapes. 7. Bake at 400'F 25 minutes or until golden. Place on wire rack to cool. 8. Drizzle Rose Water Syrup evenly over top and allow to soak several hours.